It doesn't get anymore Southern than shrimp and grits. Honestly, I have never even heard of shrimp and grits until I moved down here a few years ago. And look at me now, whipping up my own batch for dinner. My CSA bag of veggies from Hampstead Farms always inspires me to make something new. I don't know why I can't feel the same inspiration from shopping at the supermarket when I can choose from an array of vegetables. It makes me feel like I would be a good candidate for the cooking show, Chopped. On the show, four chefs compete by taking ingredients from a mystery box and turning them into a dish that is judged on their creativity, presentation, and of course, taste with a limited amount of time to plan and execute. Anyways, the CSA ingredients that had inspired my shrimp and grits today were chives, elephant garlic and okra. According to my sweet, dear husband, I won in all three Chopped criteria with this dish. Tell me what you would make with these three ingredients. for the shrimp, cooked bacon in a non-stick pan over medium heat until crisp. remove bacon and cool on some paper towels to absorb the grease. with the left over bacon grease in the pan, cook garlic and okra until soft. add shrimp and cook until shrimp is pink. add 1/4 cup of chicken broth and cook for a few more minutes until liquid reduces slightly. add salt and pepper to taste. remove from stove. for the grits, place grits, water, and a pinch of salt in a saucepan. bring to a boil and reduce heat to low. cook for 15-20 minutes. add chicken broth to preferred consistency. remove from stove. 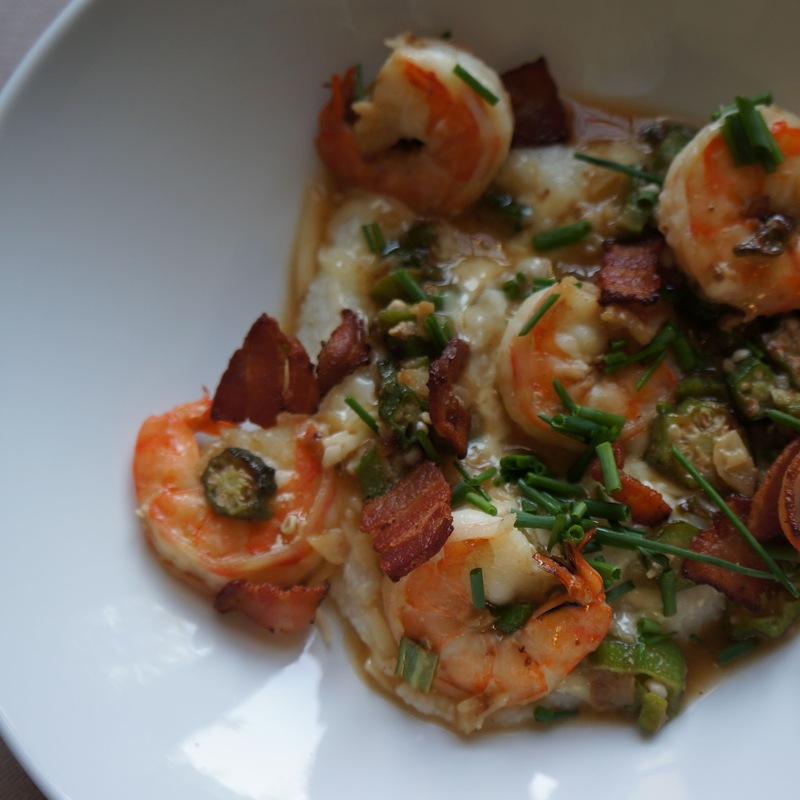 to serve, place grits at the bottom of a serving bowl, top with cheese, shrimp and okra, bacon, and chives.